Why settle for boring burgers when you can have these flavorful lettuce-wrapped sliders instead? We've skipped ketchup in favor of a tangy mustard sauce and sweet caramelized onions. Frying up the burgers in butter gives them even more flavor. Pro tip: Use beef with at least 10 percent fat—anything less and you risk dry, flavorless patties. For the mustard sauce, place the mustard, egg yolk, and salt in the bottom of a medium-sized bowl. Whisk to combine. Add in parsley, tarragon, spring onions, and pickles. Mix. Slowly pour in olive oil, whisking all the while to obtain a sauce that is smooth and creamy, a little like a mayonnaise. Cover, and set aside in fridge. Thinly slice the onions. Heat 2 tablespoons olive oil in a skillet over medium-high heat. Place onions in skillet, stir, cook for 1 minute on high and then turn heat down to low. Caramelize onions, 20 to 30 minutes, stirring occasionally. Salt and pepper the ground beef and shape into 12 mini burgers. Place 1 tablespoon olive oil and butter to melt in a skillet over medium heat. In batches, cook burgers 3 minutes on each side (or longer for a well-done burger). 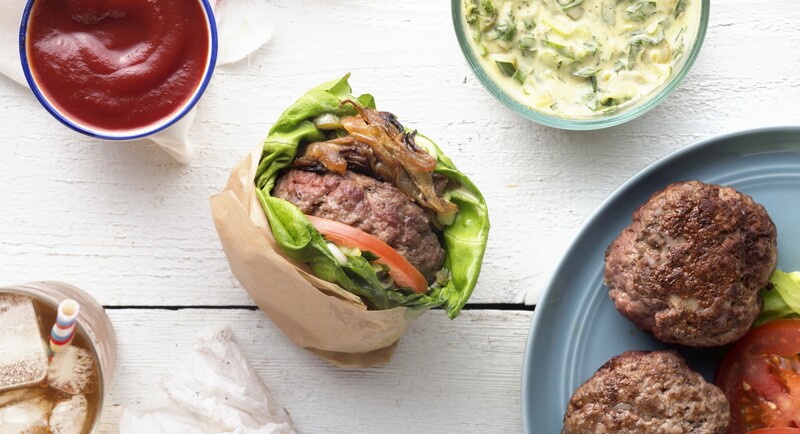 Top each burger with caramelized onions, mustard sauce, and a slice of tomato. Wrap in lettuce leaf and serve.